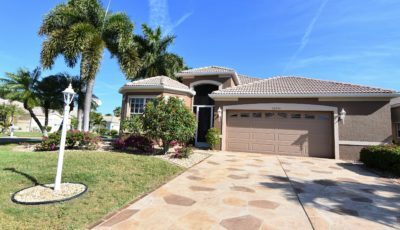 Come live the Florida lifestyle in style! This is a wonderful opportunity to own a home with almost 2000 square feet under air in the desired “maintenance free” community of the Villas At Charleston Park. This property is a must see with its expansive view overlooking the private pond within the community – no matter which way you turn when you’re sitting on your back lanai. This is in your own backyard! Take a look at the aerials. This home offers 3 bedrooms 2 baths – tiled in most areas – and a 2 car garage with a beautiful front porch and back lanai to enjoy all of the views that this home has to offer. Has it been hard to find a maintenance-free and gated community that will allow your 4 legged family members? Look no further! This pet-friendly community allows them!! What are you waiting for – this one won’t last long. This community has so much to offer – call to schedule your showing today! !